The Ram varsity softball team played host to the East Kentwood Falcons in an OK Red contest, Thursday, May 10, and showed to be tough hosts. The Rams topped the Falcons by a 9-0 score, in a game that only saw six innings. It took a while for the Ram bats to get going, but once they did East Kentwood couldn’t stop the offensive onslaught. Rockford plated five runs in the third inning, three in the fourth, and one in the fifth to earn the mercy-shortened win. 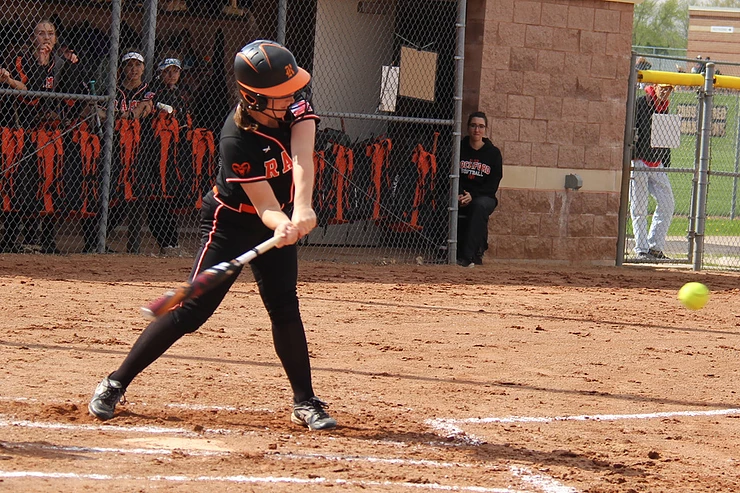 The Rams were able to tally 13 hits, with Addison Binney slamming a grand slam home run in the third inning to become the catalyst to Ram scoring. Binney tallied four RBI for the Rams with that one swing of the bat. Jenna Davis and Lauren Lanphear also had a big night at the plate, each netting three hits apiece. Davis earned the win in the circle for the Rams, giving up no runs on just four hits.